The first ever Migoual Concept race took place on the 13-14th May 2017. A simple “concept:” start from Millau, south Aveyron, France where Norman Foster’s spectacular viaduct spans the Tarn, run along the GR62 marked trail to the top of Mont Aigoual in the Cevennes and return to Millau along the same route. Total distance out and back of 130km. To allow the race to take place with a minimalist organization, all were in teams of two or three, running on a buddy system meaning that hopefully, nobody would get lost – or at least if they did, they would have company. The Migoual event is an addition to the established ‘Verticausse’ weekend which includes races of various lengths and dénivellé (vertical ascent). The main eponymous run, favored by the elite runners, is a marathon length trail run with over 2000m of ascent which the elite finish in around four hours. I have run a few long distance runs before, these have all been on or around the 80km limit between ‘trail’ and ‘ultra.’ I was not too concerned myself about the extra 40 k but my family was. My daughter in particular advised against. She was somewhat mollified by my promise not to ‘overdo it.’ This was easily made since I never overdo my sporty events, always run or bike in my comfort zone and can’t imagine how Paula Radcliffe does it with all the grimacing. The race started at a very civilized 10am with a briefing at the Café du Golf. We were provided with maps of the run and one member of each team carried a GPS beacon so that the organisers, family and friends could follow us along the route. After a couple of great free expressos, all part of the deal, along with big chunks of sugary fouace, a local specialty, an orange flower water flavored brioche and excellent fuel for trailers. Speaking of which, Anglophone runners in France might like to know that the word ‘trail’ is in general pronounced ‘try’ in French. This can be an embarrassment when you engage with someone using the English pronunciation. We set off of under cloudy skies with a forecast of showers and even thunderstorms neither of which fortunately materialized. Millau, an old Roman town, is deep down in the valley of the Tarn and there is only one way to go… up. For us this meant a stiff climb onto the Causse Noir limestone plateau. As we plodded on, a few breaks in the clouds suggested that the earlier forecast was a bit off. Later in the day, the skies cleared pretty much completely and on the top, it really became a perfect day for a trot across the mountain. There were no sprinters in our midst but as we progressed at a steady walking pace up the road at first and then onto the trails, me and my buddy slipped gently back down the field until we were installed with the stragglers. This was no problem. The time limit for the 130 k was a generous-seeming 28 hours. There is one thing I need to explain though; my running partner suffers from a curious malady. Like other sports people as I understand, he is fine doing pretty well any distance as a training run, but on the big day, if it is an actual event, he gets nauseous and throws up. First chunder session came after five or six kilometers. Other race participants expressed concern but I explained that this was ‘normal.’ The distraction meant that we lost contact with the rest of the field and also, our way. When I checked my GPS, we were a good 500m too far along the main path. A short back track and we came across a huge cairn and a copiously signed path off to the side. How could we have missed it? Incidentally the GPS (a Garmin 64 with the IGN’s digital 1:25,000 scale topo maps) was a great, almost essential companion. Following the GR with a map during daylight is OK but at night, pretty well impossible. Around KM 1O we came across a couple with the same GPS who were puzzling over the apparent difference between the downloaded route and the path. Seemed like we were both on the same trail and there was no alternative so we ploughed on. The couple were Rumanians, he a member of the French Foreign Legion, she, his girlfriend, a tattooist. I wondered aloud what work there was for a tattooist in La Cavalerie, now home to the 13e demi-brigade of la Légion. She pointed out that the Légionnaires were a big captive market. She by the way had never run a race in her life and was just doing it because she figured that she could! The minimalist organization offered several unattended water points but only one food and rest station, strategically placed at KM 44 so that it divvied up the run into three equal parts. My buddy was of the opinion, probably influenced by his malady, that you needed to get in and out of the station asap, I was not so sure. While he operates on a low to no calorie intake, I, over the years, have taken to eating more and more? In the event we ended up taking a short break when he produced a couple of egg sandwiches. I scoffed mine in a couple of seconds. He put him in his backpack for later – I suspect he didn’t touch it. Apart from not taking a decent break at the rest point, our other error was to underestimate quite how cold the night was going to be. The forecasts being for cloudy weather had it that the nighttime temperature was not going to fall too much. But of course, the sunny day that had emerged by then foretold a chilly night on the mountain. We left with far too lightweight jackets packed. Anyhow we were still feeling pretty hot with the steady climb. Feeling good after the rest we attacked the mountain part of the race. Really a very steady 20km climb. As night fell we me the leaders coming back, rather later than I expected. I believe that the elite runners probably eschewed the ‘concept race,’ maybe waiting till it got a bit more famous. The leaders were not too talkative – a ‘salut’ ‘bon courage’ at the most. But as we went down the field folks got more and more chatty – unfortunately they all had the same preoccupation – our attire. As we would find out shortly, it was very cold on top – 5°C with a 40kph wind. We were still in shorts and singlet – The ‘attention, il fait tres froid la haut’ while we were both comfortably warm with the steady effort was getting quite irritating. I figured that we would put the little extra clothing we did have when we felt cold! We held our own until the top – a bare mountain situation with a good kilometer to run where we were really exposed. I gave short shrift to the last couple who harangued us to dress up ‘OK, OK! That’s the 15th time!’ But we complied, putting on our thin shells which really didn’t make much difference. 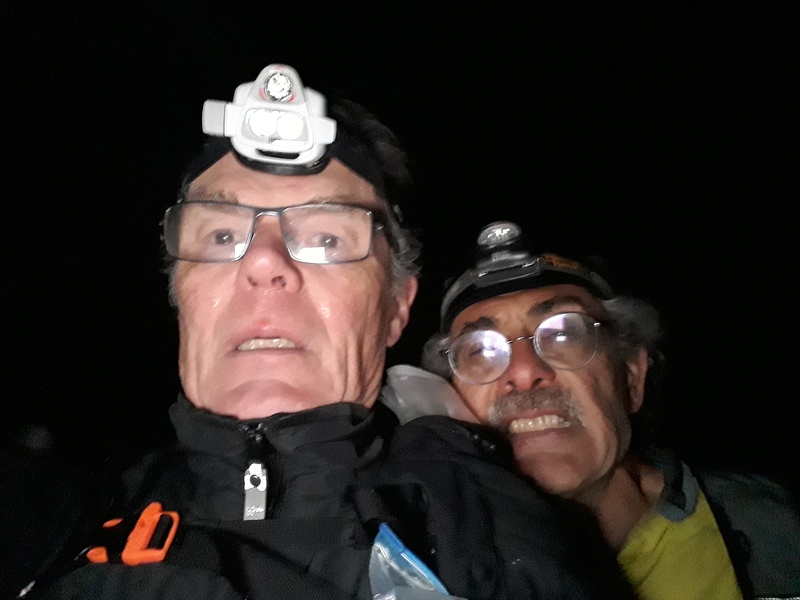 We hit the top of le Mont Aigoual at midnight, greeted by a couple of benevoles who shepherded us up the metal spiral staircase to the viewpoint. It was a clear night – you could see lights in the distance, but I was too cold to take much notice. We had been promised a ‘surprise’ on the top. Turned out to be beer (neither of us drink) and a packet of goodies – including some small sausisson sec, a packet of Haribos and some shrink-wrapped madeleines. Probably the best thing was the plastic bag these came in that served me as an improvised glove, swapping from one hand to the other as the night got colder and colder. On the way down, even out of the wind, I was still around 5°. The result was that we ran (relatively) fast to keep warm. Running fast is not a good thing to do on a 130km trail run. As our supporters who were tracking us online throughout the night (concerns for our mental health had turned into concerns for our wellbeing) told us later we moved up from pretty much last 23rd to 18th and we zipped past other teams. We also benefitted from my GPS while others, trying to follow the trails in the dark, just got lost. Another stop at the Lanuéjols watering hole – a different atmosphere altogether – some sleeping, some walking wounded. I ate some more. We both faffed around wondering what to wear next. It was still cold but it would soon be daylight. I stuck with my lightweight kit. My buddy put on his anorak. The next 10 k or so went OK although I was pretty cold and think that a degree of hypothermia was affecting my judgement. I read after the race that while your body can assimilate calories from fat, your brain needs sugar. I think – or rather I justified post facto that this was the start of my downfall. A vicious circle whereby you a) are fed up with SIS/GU type stuff… b) your brain suffers and c) you decide not to bother … and so on. I like to think that if I had kept on piling in the calories, I would not have, quite suddenly, around KM 100, started to be pissed off with my companion who was trotting down the hill I great form while I began to struggle. We lost a lot of time and by KM 110, I was pooped. Also, KM 110 was a very strategic, closest point to our holiday home where the family, a shower and hot meal awaited. I decided to bail out. My buddy completed the course with the Rumanians. All ended pretty well really. The furthest I had ever run before was 80k over a much easier course. So 110 was pretty respectable. And I find that ultras are a lot about knowing the course and oneself. A mental note for next year: more calories in, better clothing, no sprinting. One curious fascinating fact, seemingly well known to ultra runners, bloated hands! Spending a long time with arms dangling down as you shuffle along means that blood pools in your hands. It can make taking off your outer shell rather tricky! Next one is on the 12th of May. Generously, the organisers have given us an extra three hours to complete the distance. I expect we will need them. More on https://www.verticausse.com/migoual. Trying out my new Panono camera – pretending to run uphill! The Panono is a little football-shaped camera on a stick. It contains 32 cameras that all fire at once to produce what the manufacturers describe as a 360° x 360° picture. Put the above image into full screen and drag it around and you will get the picture as it were. Note that it really takes a single shot of all the surroundings, around, above and below and therefore to my mind its pictures are better described as covering 4 pi steradians.